The P-40 Warhawk was among the most widely seen and used fighters of World War II, yet it’s often overshadowed in modern-day literature by readily recognized names like Lightning, Thunderbolt and Mustang. One reason the P-40 may have been largely dismissed in the history books: It looked better than it performed. Because most who piloted the P-40 also flew other fighters, very few famous aviation figures are associated with the Warhawk. 2nd Lt. George Welch, later a 16-kill air ace, a test pilot and the model for the Ben Affleck character in the film Pearl Harbor (2001) got into the air on Dec. 7, 1941 and gunned down four Japanese aircraft. Australia’s Clive “Killer” Caldwell, the top P-40 ace, scored a remarkable 22 of his 28-1/2 kills in the Warhawk, but never lived down his self-acknowledged reputation for shooting at enemy pilots in their parachutes. The P-40 was the brainchild of Don Berlin, the brilliant but argumentative chief engineer who came to Curtiss-Wright in the 1930s after leaving another job because he clashed with another air pioneer, Jack Northrop. Berlin developed the series of radial-engined fighters known in U.S. service as P-36s (they, too, fought at Pearl Harbor) and in 1938 won a U.S. Army contract to adapt the design to use an Allison liquid-cooled in-line engine. 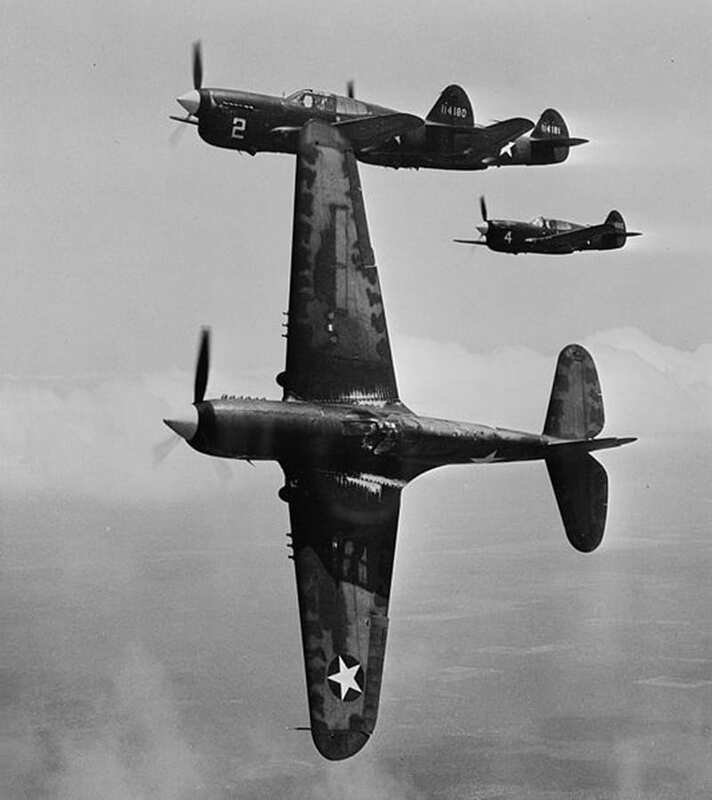 In due course, Americans adopted the popular name Warhawk for all versions while British Commonwealth and Soviet air arms used the name Tomahawk for early P-40 models and Kittyhawk for subsequent variants. On Oct. 14, 1938, test pilot Edward Elliott carried out the maiden flight of the XP-40 at the Curtiss-Wright factory in Buffalo, N.Y.
Berlin designed the P-40 around the Allison V-1710 12-cylinder liquid-cooled “monster-of-an-engine,” as one mechanic described it, with better streamlining, more power and better fuel consumption than most air-cooled radials. 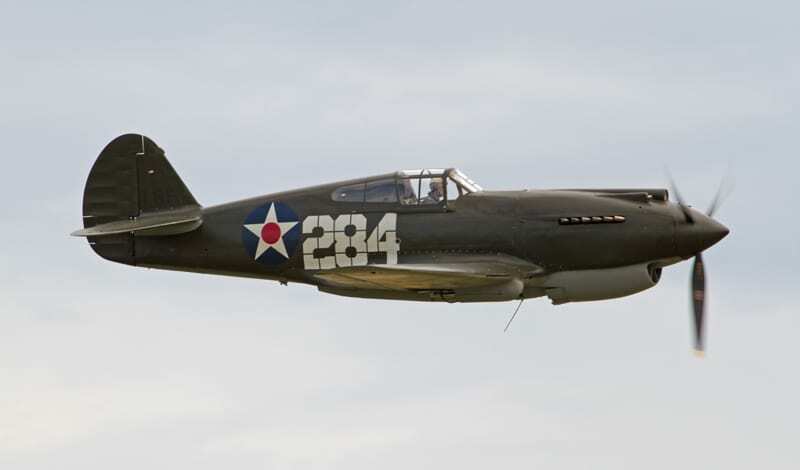 This was the “default” powerplant for about 90 percent of the 13,378 P-40s built, but it lacked a powerful supercharger for high-altitude fighting. About a thousand P-40 models later used the Packard-built V-1650-1 license-built Rolls-Royce Merlin 12 cylinder V-type engines. 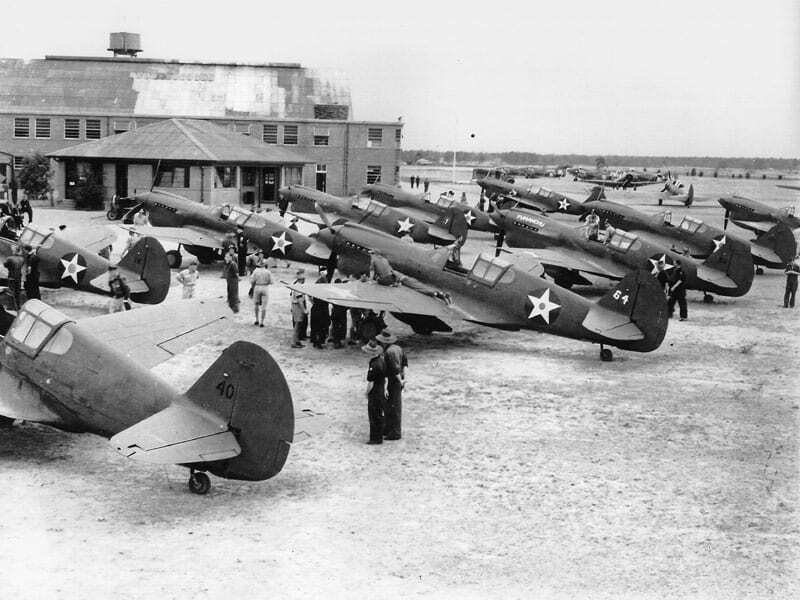 The U.S. Army had plenty of P-40B and C models when the United States entered the war. 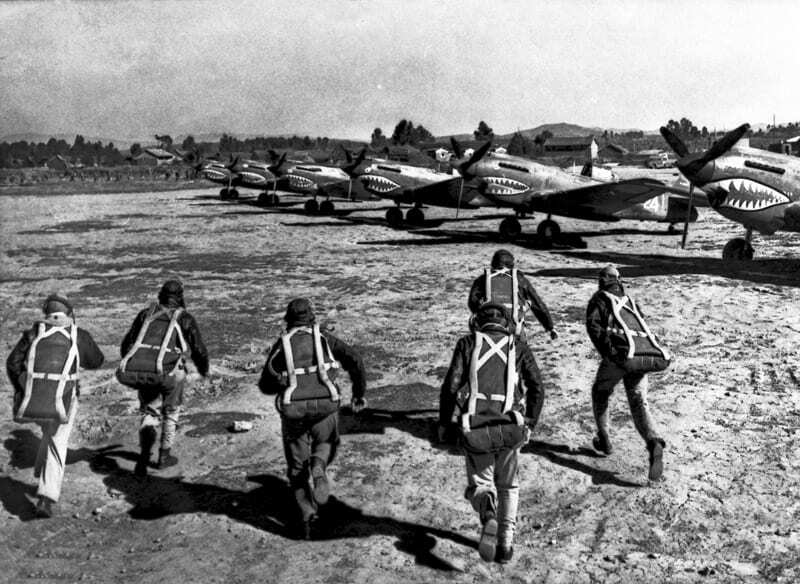 A band of volunteers, the American Volunteer Group or Flying Tigers, received P-40B export models (drawn from a batch for England) in Burma and China and fought its way into history. In U.S. military hands, P-40s often were poorly maintained and lacked for spare parts. Feeling under-equipped, P-40 pilot 1st Lt. Max Louk wrote to his mother that, “We are doomed at the start.” Louk became the first American to die in the Philippines when his P-40B ground-looped during the Dec. 8, 1941 Japanese assault. The P-40 performed better than the Louk quote implies, and was ruggedly survivable, but it was usually outclassed by its adversaries, especially Japan’s vaunted Mitsubishi A6M2 Zero. The A6M2 first flew four years later than the P-36, from which the P-40 was derived, and represented one of the rapid leaps forward in aircraft technology that took place during World War II. 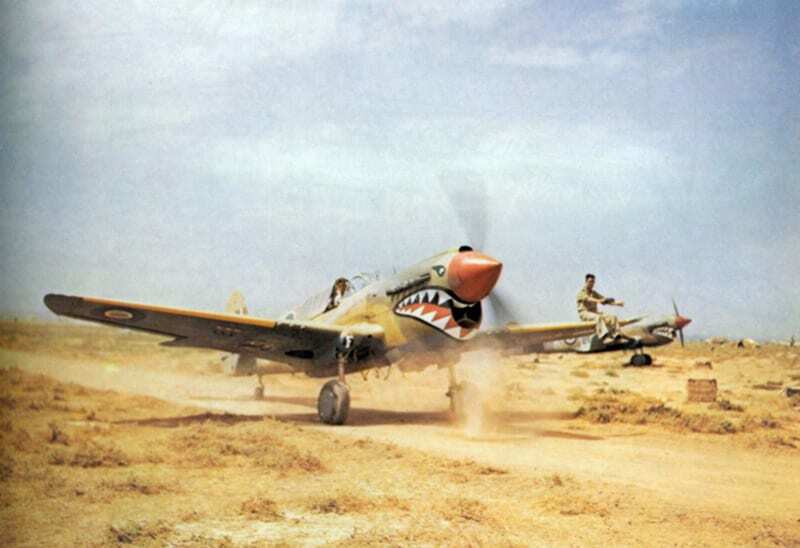 Some pilots praised the P-40 and some vilified it. As the first American single-seat fighter to be mass-produced, it took the on full weight of air warfare in several theaters of battle. Its shortcomings were partly compensated for by its sturdiness, which enabled it to absorb punishment, and its ability to outdive virtually any other aircraft it was likely to face. The P-40’s greatest fame, though, came with the American Volunteer Group in China. Organized under the command of Claire Chennault, the AVG, better known as the Flying Tigers, entered combat on Dec. 21, 1941. It existed only until July 6, 1942, when it was absorbed in the Army Air Forces and became the 23rd Fighter Group, but in that short period of time, using tactics appropriate to the P-40, it overcame the perception of Japanese invincibility. 1st Lt. Boyd “Buzz” Wagner, based in the Philippines and flying a P-40, became the first American ace of the war when he downed his fifth Japanese aircraft on Dec. 16, 1941. The P-40’s greatest fame, though, came with the American Volunteer Group in China. Organized under the command of Claire Chennault, the AVG, better known as the Flying Tigers, entered combat on Dec. 21, 1941. It existed only until July 6, 1942, when it was absorbed in the Army Air Forces and became the 23rd Fighter Group, but in that short period of time, using tactics appropriate to the P-40, it overcame the perception of Japanese invincibility. The AVG lost only 12 aircraft in air combat, while being credited with almost 300 Japanese aircraft downed by its shark-mouthed Tomahawks. Beginning with the P-40D model, the Warhawk was enough of a contender to be taken very seriously. Improvements to the Allison engine enabled the nose to be shortened and the radiator deepened, resulting in the definitive shape for this classic combat machine. Fuselage guns carried by the earlier variants were discarded and armament of six “fifties” in the wings became standard. The RAF ordered 560 of these improved fighters in 1940, and they were called Kittyhawk Is. The Merlin came with the P-40F variant. Many Merlin-powered P-40s were exported to the Soviet Union and the Free French. Most P-40Fs had a slightly lengthened fuselage, which improved directional stability. Later models had a dorsal fin as well, but reverted to the Allison engine, in part because the much-in-demand Merlin engines were going into a newer fighter, the P-51B Mustang. Further developments of this basic design, culminating in the P-40N, were devoted to reducing weight and improving performance, but the whole P-40 family remained fundamentally outclassed by other front-line fighters on both sides. A handful of P-40Ns introduced every weight-saving measure Curtiss’s Berlin could think of. They were actually capable of 380 miles per hour and under the right conditions could hold their own with the best fighters they encountered. Experimental versions included the P-40G, which evaluated the six-gun armament, the XP-40K with lightweight features, and the XP-40Q with clipped wing tips and bubble canopy. A few aircraft were converted to TP-40N two-seat trainers. Today, about 20 P-40s of various models are airworthy and about 80 more are in museums or awaiting restoration. In 1947 the Royal Canadian Air Force put its P-40s up for sale at a price of $50.00 each. To buy a fully equipped “Warhawk warbird” today would take about a million dollars. Robert: I found your article on the P-40 informative and helpful as I’m a retired mil-spec spraypainter who also is an artist. I recently got involved with the Glenn L. Martin Aircraft Museum located in Essex Maryland and became quit enthralled with illustrating WW2 War Birds. My Dad was one of the Art Directors of the time and I contacted the museum to donate a small portfolio of his and they asked if I was artistic as well. Of course I said yes and proceeded to execute a few airplanes in watercolor and airbrush acrylics and they were pleased to have me on board. I will follow your blog and glean from your expert esearch and background info. Thank you for posting. Love the P-40 ,if anyone is interested in this aircraft I have a considerable amount of photographs for trade. I’m always interested in photos, Almont. Email me at editor@faircount.com. I love the P-40 and all the stories on it. It was one of the greatest planes of WWII. I have no idea why the Truman Committee picked on it and the SB2C. They were both excellent planes with great records. I honestly think that Truman was a little touched in the head, and he was fascinated by Nazism , and the Truman Committee was him getting his little taste of Nazism, and to see how far he could go with it. Blair, keep an eye on Defense Media Network for an upcoming story about the Truman Committee written by Dwight Jon Zimmerman. It gives a good perspective about what then-Sen. Harry S Truman was trying to accomplish. I have to disagree with the author to some extent. The P-40 was a very good fighter. Yes it might seem to come up short when compared to the P-51/Corsair/P-47… All of which were newer fighters. The biggest problem the P-40 had was poor maintaince and parts issues as well as tactics… When flown using tactics re-enforcing the P-40 strengths, she could more than hold her own against any fighter she came against. Yep she had weakness (as did every other fighter) lie a slower rate of climb, but it should be remembered that the Japs rated her as the most dangerous fighter they faced… At low alt.